Real life people have featured as themselves in several Grand Theft Auto games. Most can be only be heard in voice overs but a few can be seen as actual characters. 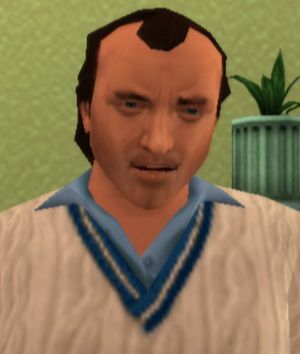 Phil Collins as he appears in GTA Vice City Stories. Phil Collins appeared in Grand Theft Auto: Vice City Stories. As well as handing out missions to the protagonist, Victor Vance, he performed a concert at the Hyman Memorial Stadium in Vice City and his songs 'In The Air Tonight' and 'Easy Lover' are featured on the game's radio stations; Emotion 98.3 and Flash FM respectively. His mission appearances are mainly concerned about the Forelli Family trying to kill him since his manager, Barry Mickelthwaite, owes the Forellis money. In three attempts by the Forellis, Vic protects Phil successfully. Katt Williams is an American comedian who appears at the Split Sides comedy club in Algonquin in Grand Theft Auto IV. Ricky Gervais is an English comedian who appears at the Split Sides comedy club in Algonquin in Grand Theft Auto IV as well as being interviewed on the radio station WKTT Radio. Lazlow has featured in all of the GTA III-era games and GTA IV. He hosts Chatterbox FM, V-Rock, Entertaining America (after Jack Howitzer shoots the previous host), Liberty City Free Radio (which Lazlow's show Chatterbox soon takes over in 2001) and Integrity 2.0. This page was last modified on 5 August 2010, at 06:23.